At the end of the booking process you will receive a confirmation email, as well as see the booking confirmation page that will contain all the details and conditions of the booking you have just made. Please make a note of the confirmation number on the screen for future reference. In the event that you forget or lose your reservation confirmation number, please contact our reservations department by telephone (T. +44 (0)28 6632 3481 +44 (0)28 6632 3481) and we will assist you with your enquiry. To make an online accommodation reservation you must: enter correct contact details and credit/debit card is required to be entered to process the booking. The Killyhevlin Hotel & Health Club cancellation policy is 24 hours prior to noon GMT on the day of arrival unless previous cancellation terms have been negotiated. Non arrivals or late cancellations will be liable for the balance of accommodation charge for the first night of the entire booking. Rates are quoted in the currency of the day and are subject to fluctuations. All rates quoted are fully inclusive of local taxes. There is no service charge. The hotel reserves the right to cancel this contract in the event of circumstances arising outside of our control. While every effort has been made to ensure the accuracy of all information, we do not accept liability for any errors or omissions and reserve the right to change our information and descriptions. To cancel a reservation, you will need to retrieve the reservation reference you wish to cancel. You can cancel online by clicking ‘Check Availability’, select ‘Cancellation’ and fill in the reference number and your reason for cancellation. Please read the terms and conditions linked to your booking prior to cancelling the booking. The expected time of arrival is after 15.00 hrs. for Hotel guests and 16.00 hrs. for Chalet guests. Please telephone reception in advance if arrival time is after 6.00pm otherwise room availability can not be guaranteed. The expected time of chect-out and room departure is before 11.00 hrs. Any alterations to these times must be arranged with the Killyhevlin Hotel & Health Club prior to arrival. Unless specifically stated, rates quoted do not include additional requirements. While every effort is made to ensure accuracy of information Killyhevlin Hotel & Health Club accepts no responsibility for errors or omissions in the provision of information, nor accepts any liabilities for loss, injury, damage, delay, expense or inconvenience whatsoever in relation to the provision of the information. 5. Obligations of Killyhevlin Hotel & Health Club, Enniskillen, Co. Fermanagh, Northern Ireland. Killyhevlin Hotel & Health Club agrees to furnish the accommodation package as set out in the reservation form. This will constitute the entire agreement between the Killyhevlin Hotel and the client. Each rate has its own specific rate description which details exactly what is included in that rate. Please ensure you check this and are happy with rate booked before confirming reservation. The Hotel shall be solely liable to you for any loss that you may suffer in connection with the accommodation reservation. If the Accommodation that you reserved is not available, it is the responsibility of the property to ensure that suitable equivalent accommodation of a similar or higher standard is arranged for you and transport is arranged to such alternative accommodation. The liability of The Killyhevlin Hotel & Health Club shall not exceed the total price for the accommodation as specified on the reservation form. In no event will the property be liable for any indirect or consequential loss by you. You agree to indemnify and hold harmless the Accommodation Provider against all costs or damages whether direct or indirect arising from any acts or omissions by you. 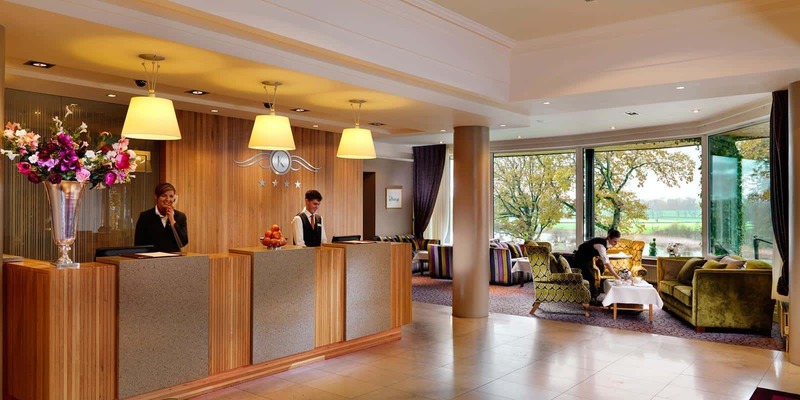 All complaints, in relation to accommodation, facilities, or additional requirements should be made in writing to the Killyhevlin Hotel & Health Club, Enniskillen, Co. Fermanagh,BT74 6RW Northern Ireland within two weeks of the event of the complaint. Every effort will be made to settle a complaint but in the event that this procedure does not satisfy your complaint will be referred to the decision of a single arbitrator appointed by agreement between both parties. If an arbitrator cannot be agreed upon, the President for the time being of the Incorporated Law Society will appoint the arbitrator. No legal action can commence without initiating the procedure above.